If you're like this beauty chick, you love M.A.C Pigments. I can't get enough ... I have them lined up in every color inside my vanity. So when I found out that there was a limited-edition set released in the M.A.C Mischief Makers Collection, I simply had to get my hands on it immediately. And that's not all. Two lucky winners will receive this set, valued at $32.50! Entering is easy. Simply enter your name and email address in the box below. The winner will be selected on Saturday, December 26 and notified by email. It's that simple! This giveaway is open to US residents only. Giveaway runs until Friday, December 25 at midnight. One entry per person, email address and IP address. Multiple entries will be disqualified. 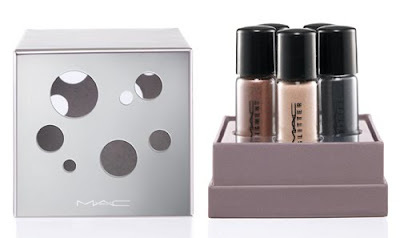 I LOVE MAC cosmetics as well ~ it's a luxury I give myself every few months. I love MAC Cosmetics. I can rarely afford them. Thanks for the chance.